Location-based intelligence is a growing area of importance in the academic library environment (as identified in the most recent NMC Horizon Report) and we’ve been exploring how Bluetooth beacons can be used to deliver information and content to users based on their location in the library space. 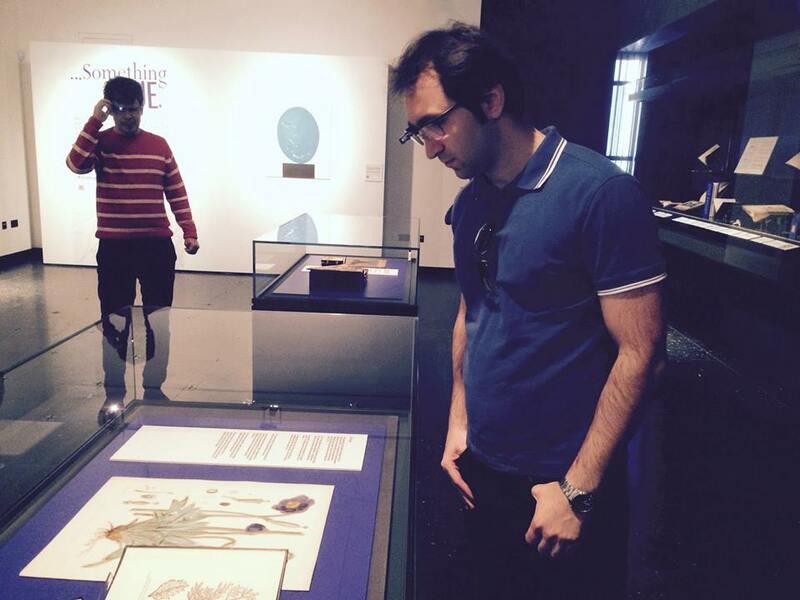 Earlier this year we used the technology with Google Glass to create an immersive visitor experience as part of the Something Blue exhibition: beacons were placed next to several exhibits in the gallery space and when users came within proximity, a video was activated on the Glass headset. 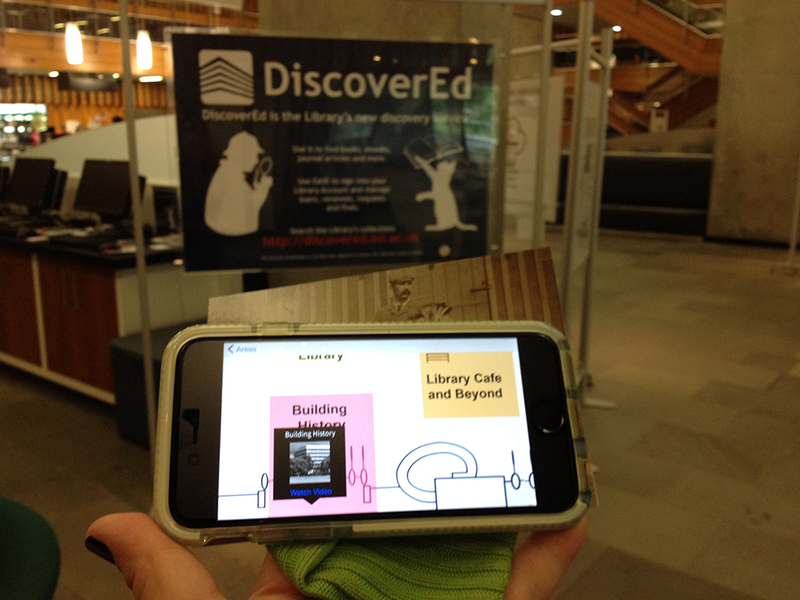 More recently, we’ve started to explore ways in which beacons can be used to provide tours of the library building itself. 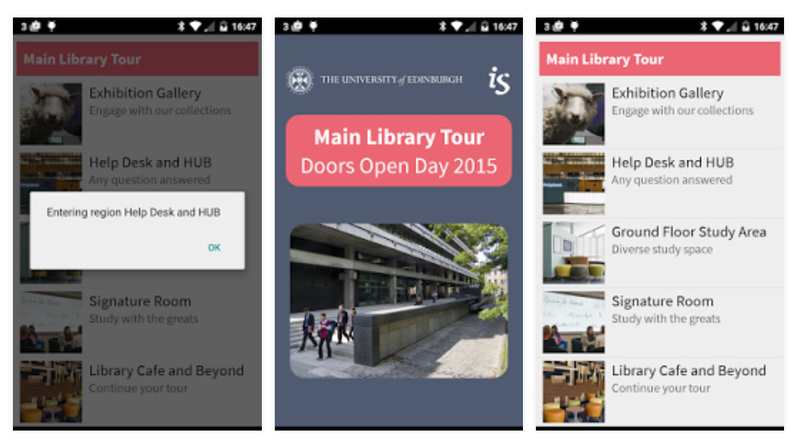 There are several potential use cases for this, such as a tour for new undergraduates showing them where key services are located, or a tour of the paintings on display in the main library for art enthusiasts, but we decided to create a tour of the building for the general public in order to tie in with Doors Open Day 2015. Our library was designed by the British architect Sir Basil Spence and A-listed in 2006: its history is of real interest to our visitors. We had originally hoped to use beacons to create a form of ‘internal GPS’ to show the user their location in the library space (much like the blue ‘you are here’ dot on Google Maps) but we found that their inaccuracy over three metres made it impossible to trilaterate location accurately enough. Around 50 people downloaded the tour over the weekend and the feedback was extremely positive. We learned some important lessons from this application, which will inform future uses of technology in this way. Have a backup content delivery mechanism: make sure the content can be accessed manually through the app if the beacons don’t work. This also allows visitors to access the videos once they have left the building. Have staff on hand to help people download the app: many visitors needed assistance to access the Wi-Fi network and download the app from the relevant online store. Make sure Wi-Fi is available: provide Wi-Fi so that visitors don’t need to use their data connection to download the app, particularly as apps can be quite large (our app was 50MB). We set up a Wi-Fi hotspot for people who didn’t have access to the network. Provide some basic signage in the physical space: let people know when they are in a beacon zone and provide QR codes linking to the app stores in order to assist with the download. Bluetooth: make sure users switch it on! The content is more important than the medium: we got good feedback for our experiment but, ultimately, a beacon is just a delivery mechanism and it was crucial that we provided high quality content. It took in the region of 50 staff hours to create seven two-minute videos. Having to download an app is a huge barrier: the need to download an app prevented many visitors from engaging with the tour. We’re continuing to explore the use of beacons in the library space and recently secured funding to see how Google’s new Eddystone beacon can be used to provide information and updates to library users throughout the building. We are especially keen on exploring the potential for Eddystone to bypass the need to download an app and will blog more as the project progresses!